In this post, we’re going to cover Balintawak Escrima footwork. A good stick fighter should have good footwork. The art of footwork varies among different stick fighting styles especially in Stick Fighting and we will cover the most commonly used footwork in the Filipino martial arts of Eskrima. These basic principles of footwork should help you get started with Balintawak footwork. So study them diligently. The basic stance is lined up along a line called the axis of confrontation. The feet are placed and spread apart much like of the distance when one is walking. The body should be relaxed. The feet must have an angle of 45 degrees to the body’s major axis. One must be set at a 45-degree angle like a runner. Knife striking techniques that develop accuracy and dexterity for effective combat. Click Here! Turn to one side to present a tight target from afar. This helps ensure that you are not exposing the area you are protecting the opponent. It also enables you to strike faster when needed without having to twist too much to generate enough speed and power. This may be observed in an on-guard stance wherein we hide the groin from view through maintaining a stance in sideways. At close distance, shift to a frontal position, allowing the backhand to be utilized. This is observed in escrima corridas drills. Cover the head at the back of the shoulder, at the gullet behind the jaw. The jaw must be confined to shield the throat. It’s a universal rule to position the elbows lower and closer to the torso and have no less than one hand protecting near your head. The guarding hand is utilized to check and to block. Once in an alert position, hold the backhand high and the front hand low from afar. When in an in-fighting variation, hold two hands higher to guard the head. This allows you to control the fight. Your free hand will be controlling the weapon-hand of the opponent while you’re weapon hand will be used to strike him at different angles. The weight is ideally centered between the legs unless evading and moving. The weight distribution may change according to the weight’s movement over a foot or another. Without leaning, the weight may still be moved in such a way that it is centered more over a single leg than the other one, but each leaning involves such motion and the legs’ differential bending. 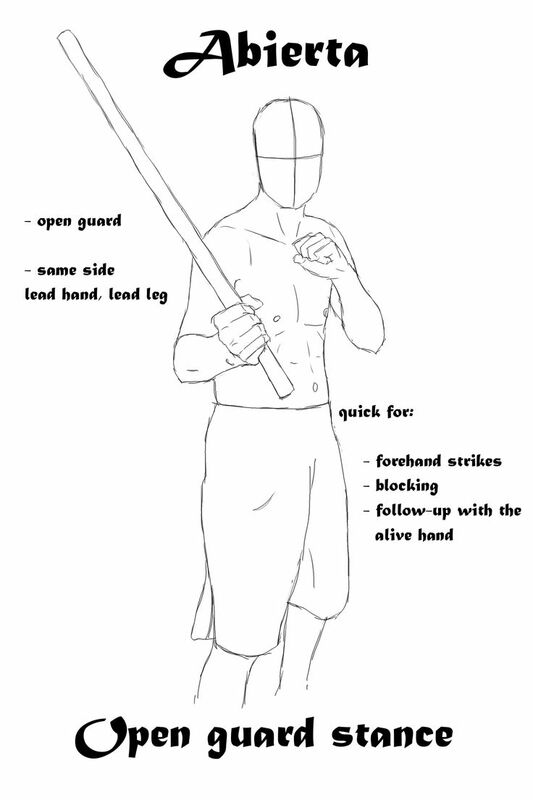 Balintawak Eskrima footwork – Slightly leaning forward is basic stick fighting position. Leaning the body involves slanting the chest in such a way that it is not vertical. This is done by bending the knees, not the back; or else back trouble can eventually result. When it comes to your body, you can lean backward, sideways, or forwards and these can be done by the twisting of the feet. A key component to most of the movements is twisting. This involves the degrees to which the hips turn, side to side, and feet rotation. It’s the main principle of power and evasion. The degree of twisting is what differentiates side leaning from front leaning and rear leaning. To have more power, twist into a blow. Do not twist when both feet point along the similar line and don’t twist too much that the legs cross. This is observed in a few other martial arts, except in Balintawak arnis. If you twist too much, you will be late in striking or blocking by split seconds. Those split seconds could determine life and death in a fight. Louis Lim twisting while striking. This is a word that describes the center of gravity’s height over the ground. Bend the knees to raise and lower the body to change the level or altitude. This provides us with the leaning and crouching motions. When both legs are bent to the same degree, we obtain a neutral crouch. When a knee is bent too much than the other, we get lean. Never kneel since kneeling can cause poor balance and mobility. When fighting at ground level, you can squat and move your legs at the squat position. This type of footwork can be strenuous to the untrained legs. Thus, you need to condition your legs to be able to fight at a squatting position. 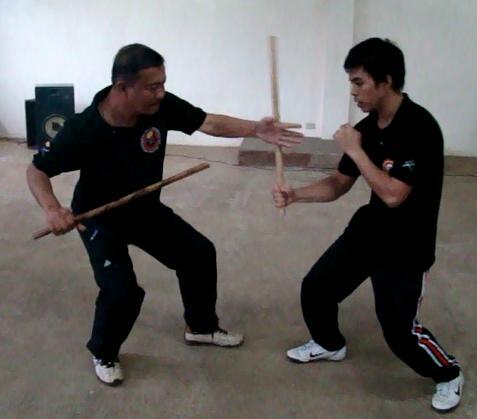 Master Andrew P. Obon of Balintawak Eskrima doing a corridas drill with a senior practitioner. Slumping is dropping the center of gravity, along with some twisting combination, weight dropping, weight moving from a leg to another, leaning through knee bending differentially, weight shifting distribution to slump, you should utilize a rapid body weight dropping through bending the knees. You can slump using a neutral position, a forward lean, a rear lean, a rear face, or a side lean. This promotes proper balance and leverage. The center of gravity or geared forwards. Thus, it becomes easier for your strike. Your strike has more power because your body goes with it. Footwork is very important in Stick Fighting because you will be trying to hit a moving target. You will need good footwork to adapt to your opponent’s movements. Footwork will also allow you to move in different directions easily, allowing you to strike at different angles. Thus, footwork is very important and you must practice it diligently.